Seventeen inmates at Cumbria's only prison were caught high on drugs in a single day of "mass intoxication", a watchdog has found. In its annual report, the Independent Monitoring Board (IMB) said the use of psychoactive substances at HMP Haverigg was "disturbing". Drugs may also have caused the death of two inmates, the IMB said. The Ministry of Justice (MoJ) said the prison was "taking innovative action" to tackle the use of drugs. The IMB report said that further fatalities "have only been prevented by the swift and effective action of officers and healthcare staff". Referring to the "mass intoxication" incident, it added: "The Board has observed on an at least weekly and, on occasions, a daily basis, the consequences of the use of illicit substances, culminating, in one instance, where seventeen prisoners were found to be under the influence of psychotic substances. "The impact on the populations of south and west Cumbria, because of the concentration of Northwest Ambulance Service resources at the prison that day is likely to have been significant." However, the report did commend the prison's GP for "strictly implementing" British Medical Association (BMA) guidelines to reduce the availability of "tradable medication", as well restricting medication when abuse was uncovered. 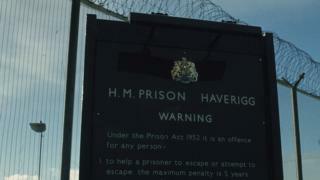 A statement from the MoJ said: "HMP Haverigg is taking innovative action to tackle the use of drugs and has already reduced the number of cases where prisoners are reported to be under the influence since this inspection. "All prisoners' mail is photocopied to avoid paper soaked in new psychoactive substances getting in to the prison and a new key workers scheme has been introduced to better support prisoners misusing substances." Self-harm incidents remained steady at an average of 10 per month throughout the 12-month period that was monitored in the report, from 1 December 2017 to 30 November 2018. However, in the period of May to August 2018, this more than doubled to an average of 26 per month. Notably, at this time, there were three men, prolific self-harmers, who accounted for much of the marked increase. Despite those issues, the IMB observed "the good progress and positive impact of the Rehabilitative Culture initiative on the prison population" and that prisoners were treated "humanely".